https://nicebeauty.com/eu/babyliss-for-men-har--og-skaegtrimmer-e951e.html 69337 Babyliss For Men Hair- & Beard Trimmer Pro 45 (E951E) (U) 93.50 1 EUR InStock /Brands/Babyliss Pro 0 Babyliss For Men Hair and Shoulder Trimmers Pro 45 is an absolutely fantastic and effective trimmer for both hair and beard. The trimmer is made of solid and extra large 45 mm leaves, in stainless steel, comfortable against the skin or the hair bottom, giving a beautiful, consistent and formidable result every time. The many different adjustment options ensure that you can get exactly the length you want without further hassle and, in addition, if you want a more advanced cut, adjust the trimmer so you can have different lengths in your hair, adding your hairline a whole new game. The distance is 3 mm - 25 mm, and 8 different spacers are included to ensure a precise cut. When it comes to the beard, the trimmer can be adjusted from 0.6 mm - 3 mm. The distance of the trimmer increases by 0.6 mm per time. The trimmer can be used with and without cord, and runs for 30 minutes when fully charged. This box also contains a cleaning brush and oil to the cutter. Get a perfect knife sharp and not least a flawless result with this delicious trimmer from Babyliss. Babyliss For Men Hair and Shoulder Trimmers Pro 45 is an absolutely fantastic and effective trimmer for both hair and beard. 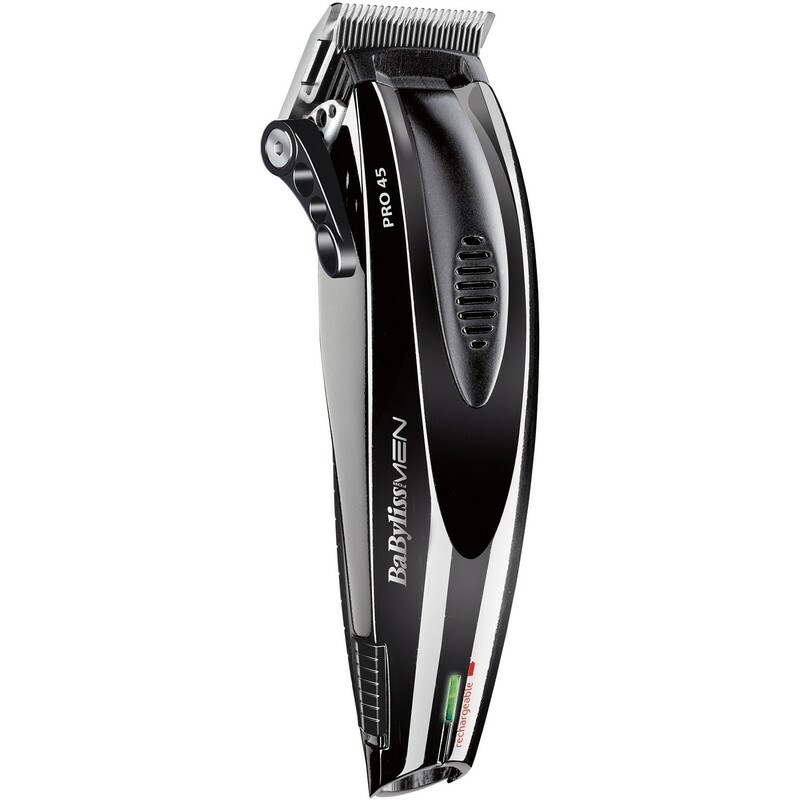 The trimmer is made of solid and extra large 45 mm leaves, in stainless steel, comfortable against the skin or the hair bottom, giving a beautiful, consistent and formidable result every time. The many different adjustment options ensure that you can get exactly the length you want without further hassle and, in addition, if you want a more advanced cut, adjust the trimmer so you can have different lengths in your hair, adding your hairline a whole new game. The distance is 3 mm - 25 mm, and 8 different spacers are included to ensure a precise cut. When it comes to the beard, the trimmer can be adjusted from 0.6 mm - 3 mm. The distance of the trimmer increases by 0.6 mm per time. The trimmer can be used with and without cord, and runs for 30 minutes when fully charged. This box also contains a cleaning brush and oil to the cutter. Get a perfect knife sharp and not least a flawless result with this delicious trimmer from Babyliss.